Healthy eating is notoriously difficult to describe nowadays, with all the different wellness “gurus”, celebrity detoxes and fad diets all making conflicting claims about what constitutes as “healthy”. Not only are their recommendations confusing, but they are often expensive! They can leave you feeling like it’s impossible to eat healthier on a budget. Here at Frugal Minimalist Kitchen, I don’t subscribe to any of those ideas, as they are just short-term “solutions” and quick fixes. On the surface they may appear to be harmless healthy eating inspiration, but can actually cause a lot of problems. Diets claiming to be the ultimate health cure-all cause wasted money, shame and guilt about food, food fears, and disordered eating. These side effects are worse for people who have low incomes and don’t have extra money to spend on expensive ingredients and supplements. Lucky for you, the key to health does not lay in the hands of celebs and fad diet trends. The most basic foundations for healthy eating are actually super simple and are obtainable even on a very small budget, and many are even free! I like to put my energy into the things that will provide the most significant impact for my effort. If you incorporate these guidelines into your eating habits I assure you that, overall, your eating pattern will be on the right path. There are many cash back and reward programs that pay you when you shop. My favorite cash back app is Checkout51. I got over $80 cash back over the past year on products that I was purchasing anyway, just by sending them a photo of my receipt! Plus you can get $5 just for signing up and trying it out! Try it HERE. I also use PC Optimum to earn rewards whenever I shop at No Frills, Shoppers Drug Mart, or Loblaws and have earned about the same amount as on Checkout51. Additionally, I use my credit card to earn 1% cash back on all my purchases, which nets me $5-10 per month that I can use towards the balance of my card. With these three free cash back tools, I’ve earned about $250 over the past year, or an extra $20 a month. I eat healthier on a budget by buying fresh, healthy groceries with that extra $20 per month! What would you do with an extra $20? A garden gleaning group is a group of volunteers who help harvest excess or leftover produce. Imagine all the apples that just fall to the ground and rot from that prolific apple tree of your elderly neighbor. 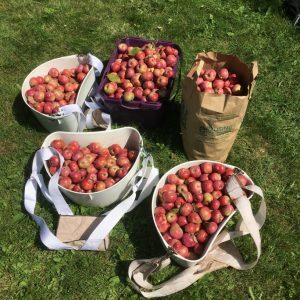 A garden gleaning group can come and pick all the apples when they are ready, so they don’t go to waste! The food is divided up amongst the volunteers, a charity like a food bank, and the owner of the garden, farm, or fruit tree. This is a great way to get local, ripe, seasonal produce for free, with the added bonus of helping others! I signed up with Not Far From The Tree which operates in my area. Volunteering with them has definitely helped me eat healthier on a budget. 105lb of apples were picked from one apple tree! The bounty is split evenly between the tree owner, a charity, and the volunteers. We took home about 15lbs of apples! Cooking from scratch is the ultimate way to save money in the kitchen and eat healthier on a budget. Basically this is trading some time in order to save money so you will have to decide if it is worth it to you. I really enjoy baking and experimenting in the kitchen so I consider the time spent baking bread or making yogurt as part of my entertainment! I might spend a half hour of hands-on time making bread each week. For 2 loaves of the least expensive bread at the store, I would spend over $5 (more if I were to buy the good stuff). I can make 2 beautiful loaves of whole wheat sourdough bread for under $1 at home! I could make an Indian curry at home for $2 a person, or get takeout that would cost at least $10 a person! Staying hydrated is essential to good health as our bodies need adequate fluids to function properly. Dehydration can cause issues with our skin, memory, energy levels, balance, hunger cues, digestion, and many other issues. If you are fortunate enough to live in an area with access to clean drinking water, the most frugal option is tap water. If not, try to invest in a reusable water filter of some sort. Buying bottled water should be your last resort. It is neither friendly to the budget nor the environment. Additionally, if you drink other beverages like soda, juice, or energy drinks, you can improve your health and your budget by switching to water more often. You can stay hydrated by drinking milk, juice, tea, coffee, sparkling or flavored waters. You can even eat foods with high water content such as vegetables, fruits, and soups to stay hydrated. Make sure you bring your reusable water bottle whenever you leave the house so you always have something to drink and you don’t have to buy something on the go, or go without. You likely know that deep fried foods aren’t the most nutritious. When cooking at home, or even eating out, choose foods that are steamed, stir-fried, baked, barbecued, roasted or stewed. These cooking methods keep the nutrients inside the food and don’t add additional grease like fried foods. Choose to boil, fry or deep fry foods less often. Did you ever notice the green or orange water after boiling vegetables? That is some of the nutrients from the vegetables going down the drain! Choosing different cooking methods when cooking at home adds no additional cost an enables you to eat healthier on a budget that is tight! Choosing the wholegrain version of bread, pasta or flour more often is a great way to eat healthier on a budget. Often the wholegrain version is the same price as the white version of the same food, although not always. Even choosing the wholegrain version ½ the time will provide a nutritional benefit. The benefit to whole grains is that they contain more fiber than the white version. Fibre keeps us full longer, reduces blood sugar spikes, improves digestion, decreases cholesterol levels, and more! Choosing the plain or unsweetened version of a food will help reduce the amount of sugar in our diet. Like everything in this list, it doesn’t cost a dime extra! Now here’s the thing, I’m not suggesting in any way that we need to completely eliminate sugar from our diet to be healthy. In fact, doing so can actually increase risks of unhealthy food behaviors such as food fears and orthorexia! The reason I list choosing lower sugar options as a way to eat healthier on a budget is that it is really easy to get too much sugar from everyday foods. Food manufacturers add a lot more sugar than is needed to make the food taste good, in my opinion. Say you always eat yogurt with fruit and granola for breakfast. If you use sweetened yogurt and sweetened granola and add naturally sweet fruit, you have 3 sources of sugar in your meal which can easily add up. You have a limited number of taste buds, so after a certain level of flavor, you can’t even necessarily sense any more sweetness! See how it tastes if you switch out the flavored yogurt for plain, while keeping everything else the same. My guess is it will still taste great! You’ll have made a simple, completely free swap to reduce your sugar and eat healthier on a budget. Another thing I love about plain yogurt is that it can be used in a variety of other recipes like curries and dips. You can even swap it out in any recipe that calls for sour cream. Multipurpose ingredients are the backbone of a frugal minimalist kitchen! Please note that the unsweetened is different from artificially sweetened. I’m not a big fan of artificially sweetened foods as I don’t think they taste very good and most artificial sweeteners are a common cause of indigestion. Artificial sweeteners are considered safe to eat, but if you do eat them, I would still use them only occasionally and in small amounts. Similar to choosing the lower sugar version of a food, there is nothing inherently wrong with sodium (found in table salt and sea salt). Too much salt can cause high blood pressure, fluid retention and other health concerns. The lowest sodium options are actually whole foods that are naturally low in sodium such as vegetables, fruit, legumes, meat, and milk. A quick reference when choosing packaged foods is to look for ones that say “no salt added”, “low sodium”, “reduced sodium”, or are from brands like PC Blue Menu. Any of these choices will contain less salt than the original version. If you want more information, look at the sodium level on the Nutrition Facts Panel. Foods with 5% or less of the Daily Value (DV) for sodium are considered low sources, 15% or less are considered moderate sources, and more than 15% are high sources. Take a moment to look at the sodium levels to compare different flavors and brands of the same product. If the price is the same, making the lower sodium choice is an easy way to continue to eat healthier on a budget. I don’t know about you, but part of my definition of health is the absence of illness. Foodborne illness (food poisoning) can cause nausea, vomiting, diarrhea, dehydration, hospitalization and even death! It will affect everyone at some point in their lives, but it is almost 100% preventable by following the basics of food safety. Control the temperature of your raw and cooked food so it is not at room temperature for more than 4 hours. The less time here, the better to prevent bacteria from growing on your food. Fully cook and reheat your food to kill any bacteria that may have grown. Safely store leftovers in the fridge for up to 3 days. Longer than that and your risk of food poisoning goes up a lot. If you won’t eat it by the third day, freeze it so you don’t have to throw it out. Avoid cross-contamination of raw foods like meat with ready to eat foods like salads. Store raw foods on the bottom of the fridge so they don’t leak onto other foods. Wash your hands, countertops, knives and cutting boards thoroughly in hot, soapy water. Not only does keeping your food safe reduce your risk of getting sick, but it also reduces food waste due to spoilage. It is another completely free way to eat healthier on a budget! Eating mindfully is about eating the type and amount of food that feels good for your body. Eating this way gets us to tune into the needs of our body. Eating mindfully may increase satisfaction with your food simply by paying attention to your level of hunger/fullness and how the food tastes. Mindful eating can also help improve digestion. Your body will start increasing levels of digestive enzymes in response to the thought, sight, smell, and taste of food, even before you’ve swallowed anything! Pausing before and during your meal to check in with your hunger and fullness cues allows your body to pre-emptively produce enough digestive enzymes. It’s like warming up before going for a run. Additionally, taking a few moments to be aware of your meal will naturally slow down your eating a bit. One simple way to incorporate mindful eating is to take a brief moment before you start to eat to rate your hunger on a scale of 1-10, where 1 = completely starving and 10 = completely stuffed. Partway through your meal, take another pause and rate your hunger again and see how you feel. Ideally, we would stay between about 3-7 and avoid the extremes, which stress our bodies and are quite uncomfortable. We can also pause to appreciate our meal or ponder a question. Some examples are: How do I feel today compared to usual? What would satisfy me? Am I more or less hungry than usual? Am I reaching for this snack because I’m actually hungry or is it because I’m stressed, tired, bored, etc? Really, the only mistake you can make with mindfulness is to judge yourself. It’s about checking in and listening to your body, and getting out of autopilot mode. It’s not about controlling your body. It’s perfectly ok to eat emotionally, for example. If you find yourself eating emotionally more often than feels good, consider other ways to deal with those emotions that don’t involve eating. I always like to say there is nothing better than a good meal shared with good people. Eating with others is another 100% free way to improve your eating habits without spending any extra money and eat healthier on a budget. You might wonder how not eating alone would affect your health. It isn’t necessarily super straightforward, but there is evidence to support the health benefits and I will try my best to explain it. One aspect of not eating alone is that talking between bites slows down your rate of eating and gives time to truly enjoy your meal. Did you know that your brain needs about 20 minutes to register feelings of fullness? This really ties into the point about mindful eating. If you finish your meal in a hurry and go back for more before allowing enough time for your brain to assess your level of fullness, you may end up feeling overfull and sluggish. Being conscious of your level of fullness, as well as your enjoyment of the meal will help you feel satisfied after eating. If you have kids, there is a lot of evidence to show that family meals are vital in teaching children healthy eating habits from an early age. They are much more likely to try new foods and eat vegetables if they see others eating them in a low-stress environment. Social eating is also tied to an increase in human connection and a decrease in loneliness and social isolation. Social isolation is strongly linked to poorer health outcomes like increased stress and depression. Stress increases our risk for almost every chronic disease. If we can reduce stress, we can reduce our risk of getting sick! Those who are struggling with depression tend not to be able to take care of themselves as much as when they are well. They tend to avoid people and end up isolating themselves more, leading to a cycle of self-destruction. I don’t know the exact stats on how often we should be eating with others vs eating alone but my advice would be to make a goal to eat alone less often. If you live with others but have jam-packed schedules that don’t allow time for a sit-down meal together, adjust your schedule so eating together becomes a priority. If you live alone and share a meal with someone only a few times a month, maybe aim to eat with friends or family once a week. Another option is to attend community meals offered in your neighborhood or place of worship. We know that healthy eating is so much more than just the type and amount of food we eat. Below, I’ve summarized the 11 ways to eat healthier on a budget that I discussed in this post. Choose one, some, or all these tips to give yourself a boost towards a healthier you while sticking to your budget. What is your best tip to eat healthier on a budget?